50 Books for 2010: #40: Am I a Redundant Human Being? #40: Am I a Redundant Human Being? 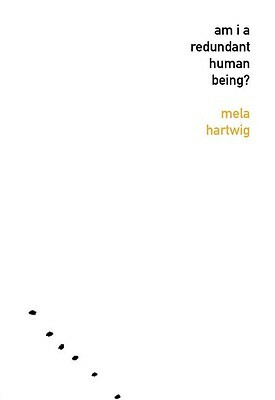 It may be that I chose to read Mela Hartwig's Am I a Redundant Human Being? based largely upon the agreeable cover art. That, and TheMillions.com's intriguing juxtaposition of this book with Elizabeth Gilbert's contemporary memoir, Eat, Pray, Love. (Yes, the one that became a Julia Roberts-led feature film and spawned Gilbert's encore, Committed: A Skeptic Makes Peace with Marriage.) From my brief intrusions into her posthumous Web presence, Hartwig appears to be most famous simply for her friendship to Virginia Woolf in the latter's final years. This is an apt metaphor for her short novel's protagonist, Aloisia Schmidt, whose most notable (and verbosely related) achievement appears to be the emulation and adoration of those select few who befriend her. Fittingly enough, I, too, have fallen prey to the vice of sycophancy: I was only made aware of the parallels between Hartwig and her creation, Aloisia, after reading someone else make this very same point. Daniela Hurezanu, writing on WordsWithoutBorders.org, asks: "Isn't the artist condemned to impersonating and copying other existences and others' feelings? Could it be that Aloisia's problem is that, in her own way, she is herself an artist, albeit a failed one?" It could be, yes; hence, my appropriation and subsequent extension of Hurezanu's observation. But I steal her point mainly because it makes sense: Hartwig, born late in the nineteenth century, became an actress and then a feminist writer, but (unless I've been hiding under a rock, which is entirely possible) has since been relegated to the dusty corners of history's bookshelves, with nary a lasting honor bequeathed to her save her acquaintance with a far more notable figure. Aloisia Schmidt, meanwhile, finds herself in much the same predicament. Faced by the suicide of Elizabeth, her friend who had fallen in love with an indifferent man, Aloisia muses, "It seemed to me that you couldn't ask more from life than this: to be capable of such a grand passion. I no longer mourned for Elizabeth. I envied her." Throughout, the protagonist continues to emphasize her overwhelmingly mundane features and betrays with deadpan fervor her utterly nonexistent self-esteem: "I...completely lacked that equilibrium between our talents and objectives that we call confidence." At one point, after she exasperates a potential suitor with her constant stream of self-deprecation, the wearied companion demands: "Why are you making it so hard to believe in you, Luise, I mean, who on earth can afford to be so hard on themselves, who? It's hubris, Luise, to think so little of yourself." And therein, perhaps, lies the crux of Aloisia's dilemma: her never-ending introspection leads to an impossibly negative self-image that is, ultimately, arrogant in its totality. I can't say I understand Aloisia Schmidt much better now than I did at the beginning of the book, but it seems that she managed an epiphany of her own, regarding an ability to feel or something of that sort. If anything, this realization was opportune in concluding a very brief novel; I'm not certain I could have made it through another hundred pages of Aloisia's self-pity. I presume -- and hope, for the sake of the late Virginia Woolf -- that Mela Hartwig did not share her protagonist's failings. Thank you for visiting 50 Books for 2010. Just because 50 books have been reviewed doesn't mean the blog is over, though. Not quite yet. I'll write a few more entries before posting a link to my next project.